New Delhi: Way back in 1972, the tiger was chosen as India’s national animal, dislodging the Asiatic lion from that status. That decision, taken at an unheralded meeting of government officials, eventually led to the conservation movement to protect the animal, including such exercises as Project Tiger. In retrospect, conservationists rue a decision that may have changed the fate of the species, now on the brink of extinction. There are currently only 250 of the large, majestic ground birds, with an unmistakable black cap contrasting with the pale head and neck, surviving in isolated grassland pockets. 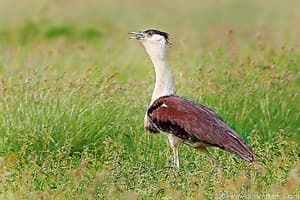 “Once known as the king of grasslands, the Great Indian Bustard is now a BPL (below poverty line) species," says Asad Rahmani, director of the Bombay Natural History Society (BNHS), referring to it being found only in the poorest districts of India. Rahmani has been working on bustards for more than 30 years and has seen how the population has declined drastically from around 1,500 birds in the mid 1980s. “There is an immediate need for an executable plan both at the national and the state level to handle this crisis and government funding is not an issue," says Prakriti Srivastava, deputy inspector general of forests (wildlife). 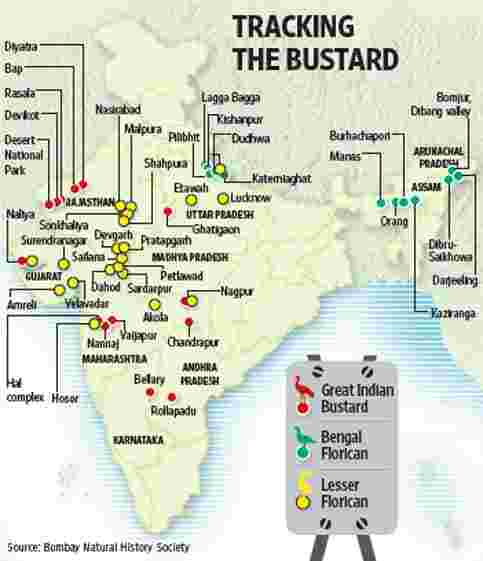 There are 25 species of bustards in the world, of which four are found only in India. Among them, three are endemic to the country and threatened with extinction— the Great Indian Bustard, the Bengal Florican and the Lesser Florican. The fourth, Macqueen’s Bustard or the houbara, is a migratory species whose numbers are also said to be on the decline. All the four species have been placed in Schedule I of the Indian Wildlife (Protection) Act, 1972, the highest degree of legal protection in the country. The Indian bustard was once a runner for the title of national bird. But if its habitats aren’t protected effectively, the bird could be headed for extinction. The declining figures are a matter of concern as a robust bustard population is an indicator of healthy grasslands. “There is an urgent need to set up Project Bustard on the lines of Project Tiger and Project Elephant," says Rahmani, who is also a member of the government task force on grasslands and deserts. “By identifying an indicator species and focusing on it and its habitat, a substantial part of our natural ecosystems, which support an array of threatened species, can be protected." Since bustards are considered a barometer of this particular ecosystem’s health, conserving the species and its habitat will lead to the protection of grasslands as well as a large number of other species dependent on such an environment, Rahmani says. While the conservation of the tiger, the rhinoceros and the elephant has merited a high profile, the slow disappearance of other endangered wild species that are ecological indicators has gone unnoticed. The Great Indian Bustard is now locally extinct from almost 90% of its former range and has, moreover, disappeared even from the three sanctuaries set up specially for its protection—Sorson in Rajasthan, Karera in Madhya Pradesh and Ranebennur in Karnataka. The beautiful black and white plumed Lesser florican has lost most of its grassland habitat in the last 20-30 years. One can spot a very few of them in scattered pockets in Gujarat, Madhya Pradesh and Rajasthan. “The vibrant leaps and display of the Lesser Florican is like the pulse of the grassland ecosystem; it’s an indicator of high grass productivity," says Gobind Sagar Bhardwaj, scientist with the Wildlife Institute of India (WII). As Goutam Narayan, a scientist at EcoSystems-India, and an expert on the Bengal Florican, says: “What’s the point of calling the Bengal Florican by its name when the species itself has become extinct in Bengal and Bangladesh." 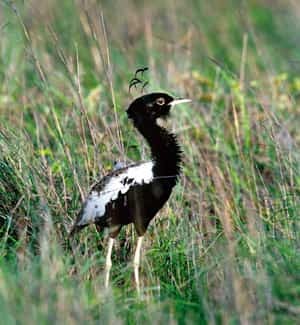 He estimates there are between 300 and 400 Bengal Floricans left in the grasslands of Uttar Pradesh, Assam and Arunachal Pradesh. The draft recovery plan stresses on the need for Project Bustard with a detailed two-part recovery plan at the species and habitat level for all three threatened varieties. Leon Bennun, director of science and policy at Bird Life International, says, “In an ever more crowded world, species that need lots of space, such as the Great Indian Bustard, are losing out. However, we are the ones who lose in the long run, as the services that nature provides us start to disappear." There has been a continuous change in land-use patterns that has degraded the ecosystem. These include grassland being used to build homes and as farm land, overgrazing by livestock, thatch gathering, tree plantation under forestry operations, flooding for irrigation projects, the building of large dams, factories and other developmental activities. All these have contributed to eroding the bustard population. According to WII reports, less than 1% of grassland comes under the Protected Area Network. With a livestock population of more than 550 million and growing, grasslands are under tremendous biotic pressure—mainly grazing and conversion to other uses. India does not have an operational grazing or grassland policy. Although the government has formulated the Draft Grazing and Livestock Management Policy (1994) and the Draft National Policy for Common Property Resource Lands (CPRLs), these policies have not been implemented effectively in the field. Grasses are considered the most evolved species of plants. They have a short life cycle. Unlike trees, when cut, they sprout back almost instantaneously. They are capable of supporting or converting themselves into huge amounts of biomass. Apart from supporting a rich and diverse variety of fauna, they absorb rain water and play a key role in water retention and hydrology of an area. The grasslands on which the bustards survive are among the most neglected ecosystems in India. They remain unprotected unless notified under the Wildlife (Protection) Act, 1972, or the Indian Forest Act, 1927. As there is no tree cover, the grasslands are not managed by the forest department whose interest lies mainly in trees, or by the agriculture department whose interest centres on crops. The veterinary department is only concerned with livestock. They are among the most productive of ecosystems in the subcontinent, but they belong to all, are controlled by none, and they have no godfathers.